With grave concern and urgency we write to you today to bring to your immediate attention the ongoing State violence and repression against civilians in Jammu and Kashmir including repeated attacks on medical services, particularly hospital ambulances, carrying the dead and critically injured civilians. Jammu and Kashmir once again faces a humanitarian crisis that requires urgent international attention and intervention. With the presence of an estimated 7, 00,000 armed forces, Jammu and Kashmir is today the most militarized zone in the world and its civilians have faced widespread and systematic attacks at the hands of Indian State forces over the last 26 years. Thus far, the region has seen the commission of human rights violations, including war crimes that have resulted in70,000+ killings, 8000+ enforced disappearances and innumerous cases of torture and sexual violence. The armed forces, through special legislation but more importantly due to direct political support of the Indian state, enjoy total impunity and to date not a single armed forces personnel has been prosecuted for criminal actions in civilian courts of law. 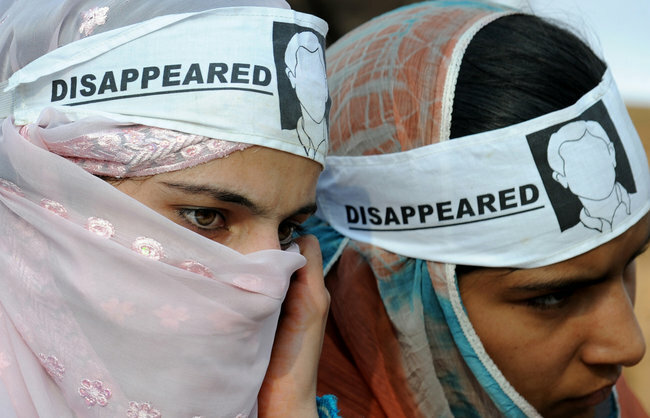 The people of Jammu and Kashmir have consistently demanded the end of Indian military occupation, recognition of their fundamental human right to self-determination and the institution of an international, independent justice mechanism to investigate and prosecute the Indian State and its forces for international crimes, including war crimes and crimes against humanity, committed in Jammu and Kashmir. It is in this context of historical injustice, targeted state violence and despair that the present violence in Jammu and Kashmir must be seen and its urgency understood. Following the killing of Burhan Muzaffar Wani, Commander, Hizbul Mujahideen [armed rebel group operating in Jammu and Kashmir] by Indian armed forces on 8 July 2016 in South Kashmir, civilians of Jammu and Kashmir, particularly in the Kashmir valley, have been subject to a brutal crackdown by State forces who have attacked those mourning the killing of Burhan Wani and thus far 42 civilians have been killed and more than 1500 injured. In the present state of crisis an accurate number of the dead and injured is difficult to ascertain and everyday more civilians enter hospitals dead, maimed and beaten. A majority of the Kashmir valley is under unlawful curfew with physical and electronic [including mobile and internet connectivity] freedoms curtailed, and in the districts of South Kashmir completely shut down. Numerous persons, including minors, have been subject to arbitrary detention. Since Friday, 15 July, Srinagar, the capital city has been caged with mobile networks shut down. Today, 16 July, the leading newspaper office of the Kashmir valley was raided and papers seized. Jammu and Kashmir is under siege. As repeatedly seen over the last 26 years in Jammu and Kashmir, the Indian State has effectively curtailed all expressions of dissent. Every attempt is made to isolate the people and ensure that the nature and extent of war crimes and unlawful violence is not brought to the attention of the international community, particularly the United Nations and its various human rights bodies. Human rights defenders have been denied free movement and access in order to ensure immunity for state forces as they operate with absolute impunity. Due to the prevailing state restrictions on communications and mobility, the following accounts of state atrocities are based on credible information received from local volunteers, health professionals, hospital visits and news agencies rather than comprehensive independent field based fact finding. From 8 July 2016 to date, Government of India through predominantly Indian para-military and Jammu and Kashmir police personnel, has disallowed all demonstrations, public gatherings including funeral prayers, protests and other public and private expressions of dissent, through the use of brutal and lethal force. In addition to 42 civilians killed, innumerable cases of grievous injuries, from bullets, brutal beatings and other lethal use of forces, have been reported. Further, more than hundred civilians [men, women and children] have been subject to horrific eye injuries, caused by the use of “pellet guns” by the State forces. Pellet guns, contrary to government claims, are fundamentally lethal weapons with limited ability for discrimination and distinction of targets and proportionality in relation to force used. More importantly, pellet guns have been used by forces with a clear intent to punish and maim civilians. Two civilians are reported to have died of pellet gun injuries. Over a 100 eye-surgeries due to pellet gun injuries have been reported thus far. In a majority of these cases it is reported that the civilians will suffer permanent loss of sight in at least one eye. The situation in Kashmir is of utmost urgency as it is clear that state violence is specifically targeted at children and youth. Shahid Gulzar, a 13 year old boy from Shopian, is the youngest civilian killed thus far, and Zohra Majeed Gilkar, a 4 year old girl from Srinagar is the youngest victim of pellet gun injuries as she receives treatment at a Srinagar hospital for pellet injuries in her abdomen, chest, both legs and forehead. A disturbing feature of the state violence has been the attack by state forces, particularly the para-military Central Reserve Police Force, on medical services, including hospital ambulances. Attacks by state forces have been reported at the Shri Maharaja Hari Singh Hospital, Srinagar [the largest hospital in the Kashmir valley, which has seen the largest intake of victims], Anantnag District Hospital [the primary hospital in South Kashmir], Sub-District Hospital, Bijbehara, and Primary Health Centre Lalpora. These attacks have included tear gas shelling inside the hospital building and state forces arresting injured persons receiving urgent medical treatment. Further, it has been widely reported that State forces have attacked ambulances [an estimated 90 thus far] carrying injured civilians to hospitals. Medicins Sans Frontier, based on Srinagar, has in an official press release noted reported attacks on medical services but declined to comment further as they have been unable to independently verify these reports. These attacks, seen during past uprisings by civilians in 2008, 2009 and 2010, on medical services are a means of “collective punishment” for the civilians of Jammu and Kashmir and are directly responsible for the morbidity of injured civilians who are not provided immediate treatment. The violence of the Indian State forces, including through the use of pellet guns and attacks on medical services, is a clear violation of Indian and international law. State forces are acting against civilians in Jammu and Kashmir as a means to collectively punish the civilian population for their continued demand for the right of self-determination. Consequently, in the context of a military occupation, the Indian State is in violation of individual sections of the Geneva Conventions, 1949, and Additional Protocols, 1977.Its actions fundamentally violate the international humanitarian law rules on distinction between civilian and non-civilian targets, prohibition on indiscriminate attacks and the rule on proportionality of use of force. In their use of force against civilians, state forces are in violation of other international guidelines such as Basic Principles on the Use of Force and Firearms by Law Enforcement Officials, 1990, and Code of Conduct for Law Enforcement Officials, 1979.The wounded and sick, and medical units, establishments and their personnel, are expressly protected by international humanitarian law, in particular the Geneva Conventions, 1949, and Additional Protocols, 1977. It has been expressly stated that they are to respected, protected and must not be objects of attack. x. Immediately, in the form of reparations, make payment where sought to victims of violence.